This is the first book to present a synthesis of rational choice theory and sociological perspectives for the analysis of social institutions.The origin of social institutions is an old concern in social theory. Currently it has re-emerged as one of the most intensely debated issues in social science. Among economists and rational choice theorists, there is growing awareness that most, if not all, of the social outcomes that are of interest to explain are at least partly a function of institutional constraints. Yet the role of institutions is negligible both in general equilibrium theory and in most neoclassical economic models. There is a burgeoning substantive interest in institutions ranging from social movements, to formal organizations, to states, and even international regimes.Rational choice theorists have made great strides in elucidating the effects of institutions on a variety of social outcomes, but they have paid insufficient attention to the social dynamics that lead to the emergence of these institutions. Typically, these institutions have been assumed to be a given, rather than considered as outcomes requiring explanation in their own right. 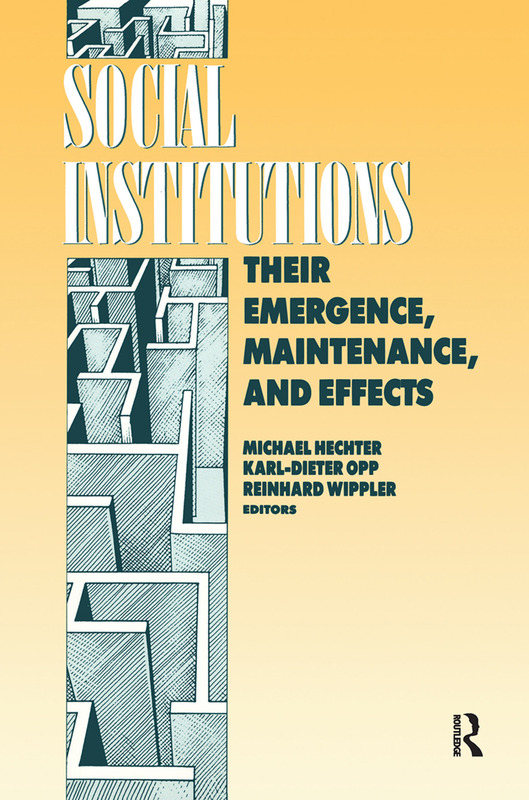 Sociological theorists, in contrast, have long appreciated the role of social structural constraints in the determination of outcomes but have neglected the role of individual agents.Michael Hechter is professor emeritus in the department of Sociology at the University of Washington. He is the author of numerous books. He became an Elected Fellow to the American Academy of Arts and Sciences in 2004 and has been featured in Who's Who. He is also currently on editorial boards for a numerous amount of journals.Karl-Dieter Opp is professor of sociology at Univesitat Leipzig. He has been a Fellow of the European Academy of Sociology since 1999 and has been member of the Council and Treasurer since 2000. He is also current on the advisory board for the magazine Mind and Society.Reinhard Wippler is professor of theoretical sociology at the University of Utrecht and scientific director of the Interuniversity Center for Sociological Theory and Methodology.